I then returned to the apartment, where I did some software development until 5:00, at which time I loaded up my cameras and headed to Park Calderon for some twilight photography of the churches near the park. 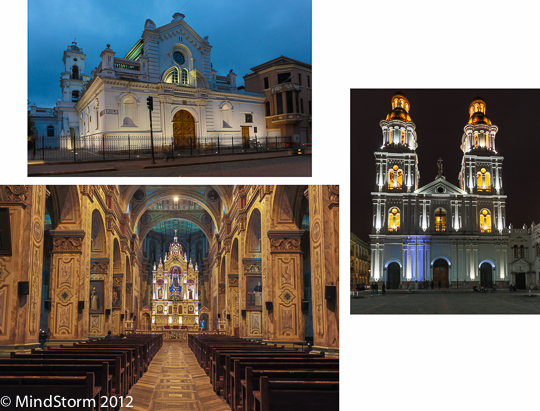 Before coming, I had thought I might make a photo project of all 52 churches in Cuenca. I have been here nearly a month and hadn’t even started yet. As it turned out, such a project has a lot more problems than I expected. For one thing, the churches are mostly big, and they are facing very narrow streets. Even with my widest angle lens, I can’t really cover many of them. For another, the weekly processions I keep hearing of seem to have no organized schedule that I can find. We just missed one last Sunday, discovering it only upon entering a church and seeing a sign announcing that it had been at 10:30 that morning (we saw the sign around 2PM). Here are images from two churches from my first night photographing them. At 7:00, we headed over to Nectar Cafe for another performance by The Jazz Society (we first saw them last Friday night). This time I came equipped with two flashes plus radio triggers for them. Last week I only had one on-camera flash, and was constantly blinding William — our neighbor that came with us, because I pointed the flash backwards to avoid the dreaded “flash shadows” from direct flash. This time I positioned one of the flashes up on a shelf and the other in a corner on the floor. That gave a workable amount of light to shoot the performers with. Jim is the ring leader of The Jazz Society (click here for their facebook page), and plays the keyboard. I gave him 4 prints from the set I shot last week, and he welcomed me to place my strobes and shoot all evening. Jorge is the guitarist for the group, though he also played keyboard tonight. I had emailed him those same images before tonight, and he graciously gave me a copy of excellent jazz CD self-titled Jorge Triana. Unfortunately, it is neither on Amazon nor iTunes, but if you find a copy and enjoy jazz, grab a copy. I guarantee you will enjoy it! Vivian is a vocalist from Nashville who joins in. 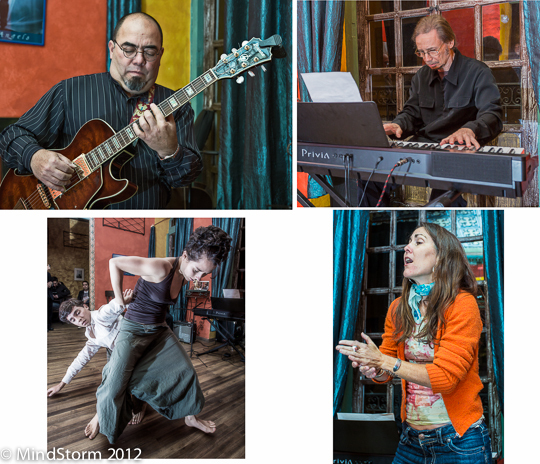 Tonight there were also two improvisational dancers joining the group. Milena is a dance instructor at the local university, and Andre is one of her students.